* Added support for multiple contact categories. * Added support for custom contact fields. 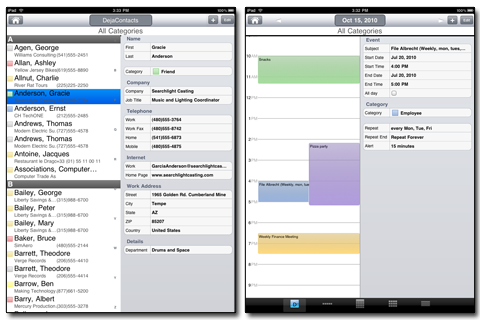 * Added Franklin style priorities for tasks. * Added support for synching TBYL tasks and events from Outlook (requires CompanionLink build 4029 or higher). * Added new interface for creating/editing tasks. New interface adds fields for contact links, Start Date, Completion Percentage, Status, and Location. * Added Title field for DejaNotes. * Added support for syncing DejaNotes via Secure Hosted Sync (requires CompanionLink build 4029 or higher). * Improved list views for all apps. This entry was posted in Announcements, CompanionLink Products, News and tagged dejaoffice, ipad calendar, iphone calendar by Andy Sheragy. Bookmark the permalink.